This page is under construction. Many more bios coming soon about our wonderful members! Steve Haworth is the owner and founder of Life Suspended. 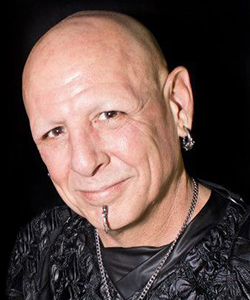 He is a world-renowned body modification art pioneer and has suspended people around the county and the globe. He has been living and working in the Valley and in the body modification and suspension fields for two decades. With James Bound he is the co-owner of the Horns and Halos production company. He personally designed and manufactures the brand of Gilson hooks and unique and creative rigs that Life Suspended uses. His titainium-pin Gilson hook design is renowned and sought after throughout the industry. Steve is dedicated to his craft and loves nothing more than to see a smile on the faces of the people he suspends. 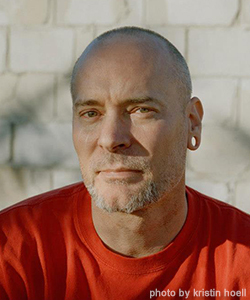 James Bound founded Life Suspended with Steve back in the mid-90’s. 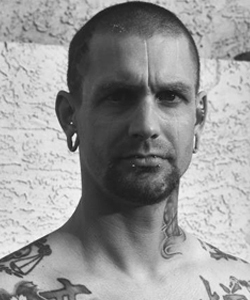 He has been a tireless promoter of the fetish and body modification lifestyle in Phoenix in the last several years. He and Steve’s production group “Horns and Halos” put on several fetish events every year. He has brought many amazing bands and acts to the Valley. Corey Busboom joined Life Suspended back in 1999, and has performed and helped the troupe whenever he could since then. Corey feels that suspensions are a good stress reliever and a way to test your personal limits. Over the years he has performed many different suspensions, such as a double suspension where another performer hung from him, a sitting lotus suspension, and even some bizarre ones like hanging upside down from his ankles or hanging from 88 hooks. His favorite suspension is the 2 Point chest, as he feels that it the most painful of all suspensions and therefore the most fun. Corey does not suspend for any spiritual reasons, as he is a devout atheist and sees suspension as a fun and relaxing hobby. Corey also graciously hosted Life Suspended parties at his home for many years, and assisted the group in a great many ways. JD Noble has been suspending since 1999, and a part of Life Suspended for almost ten years. A professional piercer for 15 years, JD is passionate about all aspects of suspending. Piercing, rigging, performing, clean up – he does it all.